Please note: the names and organizations listed here are provided for reference only, and include those who have engaged with the program at very different levels. These are provided here for reference only, and should not be assumed to support the FLOSS Desktops program, or the Open Source Initiative. Each year school districts across the United States discard thousands of computers as the hardware moves off of commercial service warranties (typically after three or four years) or are no longer capable of running the latest proprietary operating systems and desktop applications. The majority of these computers are still functional (i.e. not broken or damaged). At the same time, many schools are looking for opportunities to increase STEM (Science, Technology, Engineering and Math) within their curricula. The availability of surplus equipment and FLOSS software provides a unique opportunity for schools, teachers and students to learn about computer hardware and software. Hardware refurbishment: Students will rebuild and bring to operational condition decommissioned computers from local school districts. Software Administration: Students will install and configure FLOSS software: operating systems and various desktop applications (LibreOffice, GIMP, etc.). Mentorship: Students will develop a curriculum and teach "desktop literacy" to their peers and other members of the community using the refurbished FLOSS computers. After completion of the course, the participants will be able to take the computer home. Peer Support Center: Students will create, manage and operate a "help desk" providing those who complete the course and using the refurbished computers a resource for ongoing support. The OSI's FLOSS Desktops for Kids Incubator Project began within the Maple Hill Middle School of Schodack School District in partnership with the District's Business Incubator Program. The school administration identified the FLOSS Desktops project as a potential complement for furthering the District's academic goals in extending exposure to Science, Technology, Engineering and Math (STEM) to students. Organized within the school as the Open Source Computer Club (OSCC) in the Fall of 2014, the program is managed by the school's Technology Teacher and meets after regular class. Since it's inception, the Schodack program has been a model for other districts and organizations (e.g. Boys & Girls Clubs). Initially, provide school districts and other community organizations with professional development, educational programs and support services related to FLOSS for faculty, students and/or staff. Create opportunities for school districts in Science Technology Engineering and Math (STEM) using low/no cost, low barrier resources. Develop and document an academic program, including educational, technology and staffing resources, as well as promotional and communications resources to help other districts across the U.S. understand and implement the program. Extend the awareness of FLOSS and the OSI within K-12 education and the institutions that support it. Create opportunities for regional "OSI Centers of Interest" within the K-12 system to extend the OSI mission and resources. Many faculty and administrators working within K12 are unfamiliar with open source software generally and as an alternative to proprietary options. This program will introduce open source software as a resource to schools, increase awareness of open source alternatives to software traditionally used within education, highlight its value as both a tool to support education (i.e. a platform for educational activities), and as a resource for instruction (i.e. a set of learning objects enabling teaching and learning). The program is designed to foster community development not only across districts, but across academic disciplines and administrative areas. Teachers and staff from different schools and districts will work together, as will Technology Teachers and Librarians, K12 instructors and university faculty, community organizers and school officers, etc., thus building bridges between various types and levels of educational institutions and even other types of community groups. All academic resources, including those listed below and those under development, can be found the project's shared Google drive. Press release explaining the OSI sponsored initiative (complete). Program/resource guide for developing local FLOSS student groups / clubs based on the Schodack School District model. Schedule (recommended topics, activities, etc. toward learning objectives). Policies (issues to be aware of and address for establishing and running the program). Develop resources for the program to position FLOSS Desktops as a "pre-Google Code-in" activity (in progress). Note, this could be a significant step in achieving deliverable #8 as well as securing funding from organizations supporting programs like, Code-in, Hour of Code, Summer of Code. Identify a permanent host for the FLOSS Desktops for Kids program. Additional ideas, development status, and assignee(s) is captured in the, "Working Notes: Task List". If you're interested in helping, see our list of current activities and how to start. Content repository: Google Shared Drive provides a common space for all of the documents (final & in-progress) related to the project. "Sell Sheet" for FLOSS Desktops for Kids One page handout outlining the program, benefits, contacts, etc. Slide deck introducing FLOSS Desktops for Kids Presentation for districts, school staff, volunteers, etc. about the program. Mirrors the above "Sell Sheet". IRC Channel: Interested parties may join #FLOSSdesktops on freenode. Mailing list: A group mailing list for all participants working with FLOSS Desktops for Kids. Wiki: A collaborative working space to discuss the project (this site). The group will primarily communicate via the working group wiki page (and related discussion forum below) and the FLOSS Desktops mailing list. If you have questions about the group, please contact Patrick Masson, the sponsor, or Kristopher Navratil, the working group chair. Pilot program: June 1, 2015 with annual renewal. The initial project--designing and delivering a K12 course on open source software-- was completed on schedule with the organization of the Open Source Computer Club at Maple Hill Middle School in the fall in 2015. The program culminated with a presentation by students of their work at the University at Albany's Open Source Festival. Program/resource guide: June 2016 with annual renewal. A comprehensive curriculum conforming to the ITSE standards was developed along with teaching and learning resources to, 1. ensure the program was in line with U.S. national standards, 2. give adopting schools/districts confidence that the educational program, is comprehensive and complete, 3. help schools just starting with the program deliver a standard course, and 4. provide a launching point for further development based on unique local needs. The final goal is to find a qualified and supported organization to hand the incubator project off to. It is expected that once the Incubator Project achieves critical mass, it will either, 1. become self sustaining, or 2. will be adopted by a permanent sponsor whose work is in line with the educational objectives/outcomes of the FLOSS Desktops for Kids program. Until that time, the OSI will continue to support the ongoing work of adopters as well as promote continued growth. This table is provided to index schools currently providing FLOSS Desktops. Maple Hill Middle School Kristopher Navratil, Technology Faculty, Maple Hill Middle School Middle School Students Present at University at Albany Linux (Ubuntu), LibreOffice, GIMP, OpenShot FLOSS only used in the School's Open Source Computer Club as part of the FLOSS Desktops for Kids program. Mirman School Michael Taggart, Education technologist and writer. via a Tweet from @mttaggart. Linux Linux in the Library (rPi kiosks) supporting digital signage, for VMs in CS classes, as a desktop for one faculty member. Box of discarded computer equipment, typical of where the hardware supporting the FLOSS Desktops for Kids is acquired from (2015). Members of the Open Source Computer Club from Maple Hill Middle School (Schodack CSD) working on their computers (2015). Matthew Purificato, Schodack CSD's Computer Network Administrator, provides students a lesson on "crimping" network Ethernet cables to OSCC (2015). Member of Maple Hill Middle School's Open Source Computer Club works on "crimping" an Ethernet cable (2015). Maple Hill Middle School Principal James Derby and Technology Teacher Kris Navratil present the Open Source Computer Club to the Schodack CSD School Board with OSI GM Patrick Masson (2015). Installfest gone wild, Maple Hill Middle School's Open Source Computer Club loads Ubuntu on a 2010 Lenovo C-Series All in One (2015). Kris Navratil, Maple Hill Middle School Technology Teacher & Open Source Computer Club advisor, with students at the University at Albany's Open Source Festival (2015). Students from Maple Hill Middle School's Open Source Computer Club explain their work to Raymond Blum, Site Reliability Engineer at Google, during the University at Albany's Open Source Festival (2015). Students from Maple Hill Middle School's Open Source Computer Club talk with UAlbany professor Norman Gervais during the University at Albany's Open Source Festival (2015). Student from Maple Hill Middle School's Open Source Computer Club explaining his work at the University at Albany's Open Source Festival (Copyright, Schodack CSD, 2015). Principal James Derby of Maple Hill Middle School looks on as students from the Open Source Computer Club explain their work at the University at Albany's Open Source Festival (Copyright, Schodack CSD, 2015). Student from Maple Hill Middle School's Open Source Computer Club explaining her work at the University at Albany's Open Source Festival (Copyright, Schodack CSD, 2015). Students from Maple Hill Middle School's Open Source Computer Club at the Open Source Initiative Booth at the University at Albany's Open Source Festival (2015). Workstations completed by the Maple Hill Middle School Open Source Computer Club on display at the OSI booth at the UAlbany Open Source Festival (2015). Students from Maple Hill Middle School's Open Source Computer Club working in their meeting / club space (2016). Student from Maple Hill Middle School's Open Source Computer Club cleaning his computer chassis (2016). Student from Maple Hill Middle School's Open Source Computer Club assembles her computer (2016). Kris Navratil, Maple Hill Middle School Technology Teacher & Matthew Purificato, Schodack CSD's Computer Network Administrator, work with students from Maple Hill Middle School's Open Source Computer Club (2016). Matthew Purificato, Schodack CSD's Computer Network Administrator, works with the Maple Hill Middle School Open Source Computer Club (2016). 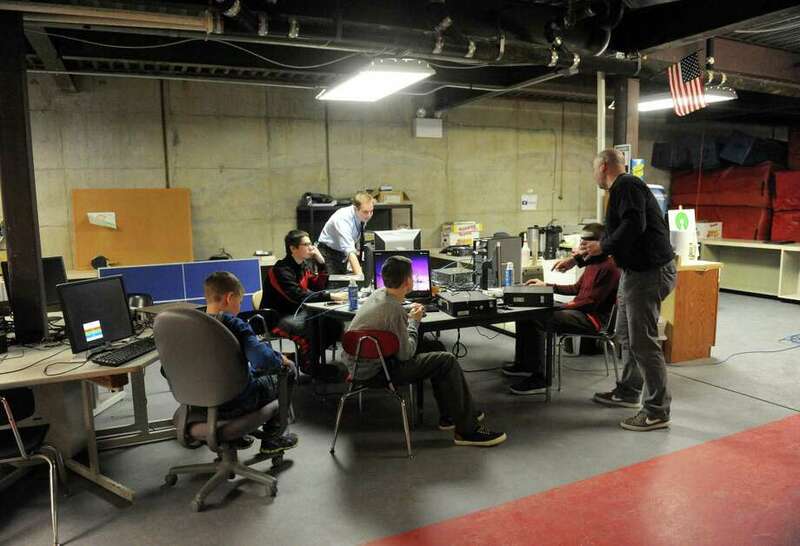 The Maple Middle School Open Source Computer Club's "Club House"--the basement (2016). Completed/refurbished computer by the Maple Hill Middle School Open Source Computer Club (2016). Competed projects (refurbished laptop and desktop computers with open source software installed) by Maple Hill Middle School's Open Source Computer Club (2016). TUX sticker on completed/refurbished Maple Middle School Open Source Computer Club computer running Lubuntu Linux. Students from the Maple Hill Middle School Open Source Computer Club demonstrate how to rebuild a computer at the University at Albany's Open Source Festival (2016). Kris Navratil, Maple Hill Middle School Technology Teacher speaks with Catherine Dumas, Open Source Festival organizer. Students of the Maple Hill Middle School's Open Source Computer Club talk with Catherine Dumas, Open Source Festival organizer. Decommissioned & discarded computers arrive on a pallet to Maple Hill Middle School ready for the Open Source Computer Club (2017). First meeting of 2017 for the students of the Maple Hill Middle School Open Source Computer Club (2017). Students with discard computers and components during meeting of the Maple Hill Middle School Open Source Computer Club (2017). Maple Hill Middle School Open Source Computer Club students "visualizing" the internal components of their computers, "Make 0: Theorize and Illustrate" (2017). Student work from "Make 0" of the FLOSS Desktops for Kids worksheets, "Theorize and Illustrate" (2017). Illustration of internal components of a computer by member of the Maple Hill Middle School Open Source Computer Club (2017). Theorization / diagram of the internal components of a computer by a member of Maple Hill's Open Source Computer Club (2017). Student worksheet from "Make 0" of the FLOSS Desktops for Kids worksheets, "Theorize and Illustrate" (2017). Student from the Maple Hill Middle School Open Source Computer Club works on "MAKE 3: Internal Identification" from the FLOSS Desktops for Kids worksheets. Student from the Maple Hill Middle School Open Source Computer Club assembles computer (2017). Students from the Maple Hill Middle School Open Source Computer Club and Kris Navratil, Maple Hill Middle School Technology Teacher show off their freshly rebuilt computers with BIOS running (2017). Students from the Maple Hill Middle School Open Source Computer Club and Kris Navratil, Maple Hill Middle School Technology Teacher show off their freshly installed Ubuntu Linux desktops running (2017). DBAN (Derisk's Boot and Nuke) screen from a meeting of the Maple Hill Middle School Open Source Computer Club (2017). Discarded computers delivered to the Maple Hill Middle School Open Source Computer Club (2017). Kris Navratil, Maple Hill Middle School Technology Teacher during meeting of Maple Hill Middle School Open Source Computer Club (2017). Kris Navratil, Maple Hill Middle School Technology Teacher leading students of the Maple Hill Middle School Open Source Computer Club (2017). Ubuntu Linux installed on refurbished computers by Maple Hill Middle School Open Source Computer Club (2017). Jim Yox, IT Director at Schodack Central Schools helps students from North Colonie's Shaker High unpack discarded computers at Maple Hill Middle School (2017). Students from North Colonie's Shaker High School prepare discarded computers for use at Siena College's Urban Scholars program (2017). Students from North Colonie's Shaker High School assemble and test computers for use at Siena College's Urban Scholars program (2017).